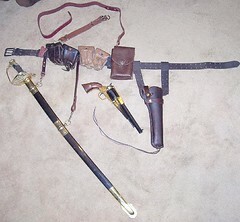 US Civil War Officer's sword, M1850 Foot & Staff Officers model. It's a reproduction from the Bud K catalog. It runs about $50 or $60. It's beautifully made. Sometimes you can find the same sword in the Cheaper Than Dirt catalog, at a slightly lower price. I'm glad you like it.